After you edit a spreadsheet in IBM® Connections Docs, you can download the file to its original format (Open Document format or Microsoft Office format), to a .csv file or a .pdf file. In an open spreadsheet, click File > Download > CSV or File > Download > PDF (.pdf) or File > Download > Microsoft Office format (.xlsx) / Open Document format (.ods). The spreadsheet gets ready to be downloaded as a .csv or a .pdf file or to its original format. If you click File > Download > PDF (.pdf), a Page Setup window is displayed. 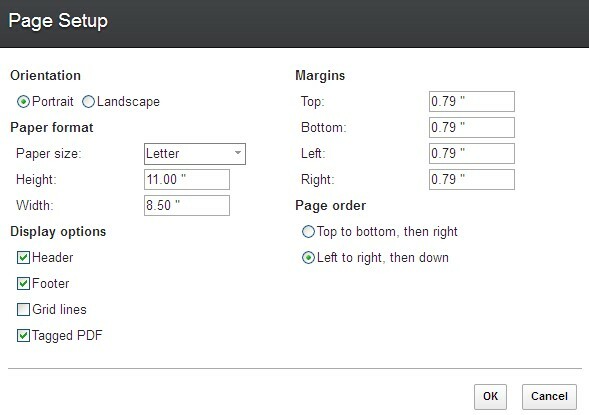 Specify the settings that you want and then click OK.
Header adds the sheet name to the beginning of every page. Footer adds the page number to the end of every page. Tagged PDF writes PDF tags, which increases the file size. A tagged PDF file contains information about the structure of the document content. This structure helps to display the document on devices when using screen reader software. Top to bottom, then right breaks a large sheet into pages that print in this order. Left to right, then down breaks a large sheet into pages that print in this order. Find the spreadsheet that you want to download, and then click More. Click Download to download the spreadsheet to its original formats. Note: Only a published version of a spreadsheet can be downloaded. By default, a spreadsheet is published every time you, or in a group editing session, the last editor, closes it. If the spreadsheet is not published, owners and editors can always click File > Publish Now. If you are a reader, ask the owner to publish.